"5/16� Hex-Head Screw. Made in one piece. Conforms to any shape. Covers 1 inch to 14 1/2 inches diameters with band lengths ranging from 12"" to 48"". " 1/2� wide galvanized steel band. 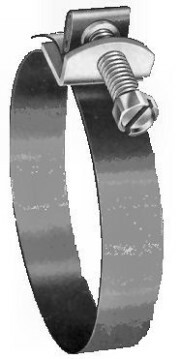 Zinc-plated, chromated, carbon steel screw and buckle.